I can smell the warmth of these fresh biscuits baking. Filling the house with the aroma and promise of warm fluffy bread as the moments pass by on a gray rain-soaked afternoon. There is butter sitting on the counter, patiently coming to room temperature so that when these are ready, it can glide across them with ease, dissolving into the next layer and onto my fingertips, before disappearing into my mouth for a quality control check. There’s something about a rainy day in the kitchen. 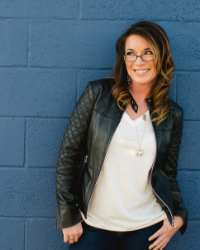 It is time well spent that can’t otherwise be enjoyed outside in the cool crisp air of fall. It’s productive and rewarding and wraps you in the security of sweater season and the joy of full-fat buttermilk. There’s a moment when you are staring out at the rolling gray clouds and the clear droplets of water while you zest the lemon and knead the dough that everything seems so calm and perfect. I judge a place by its biscuits. No matter what diet or how healthy I may need to be for an upcoming race or personal skinny jean goals, I will always take a biscuit if it’s offered. I want to feel the flaky layers crumble in my fingers and the softness melt on my tongue. 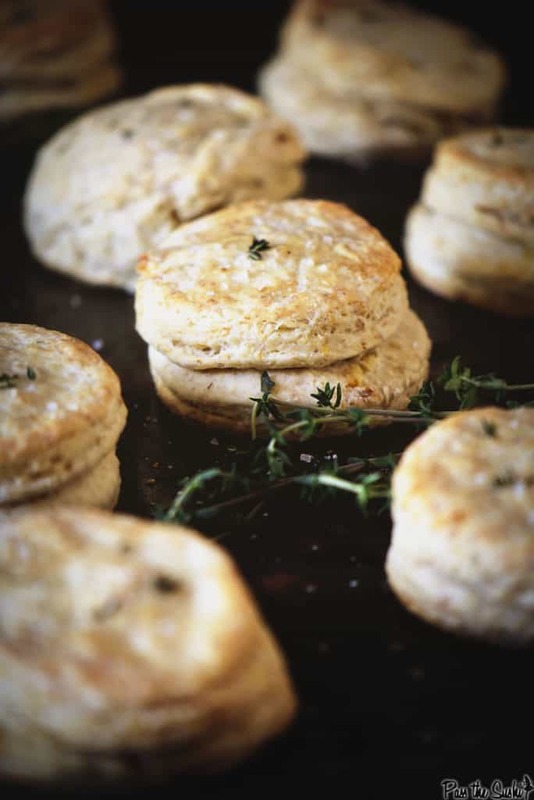 Whether they are savory biscuits hearty for a meal or sweet drop biscuits for the season, I want to test your handcrafted jams and honey on that signature recipe and give it an opinion of my own. Early this year I sat down at the Loveless Cafe in Nashville where my waitress promptly told me the biscuits were in the oven and would be on my table shortly. I think there were easily 5 of them. And three jams to pick from. All just for me. I fussed over them for a solid three minutes before that first smear of jam slid over the tiny biscuit and popped itself into my mouth. It was creamy, smooth, perfect. Everything you want from a biscuit. The only thing that would have made it better? (Besides just ordering those as my lunch and letting loose?) A midnight doggie bag with a slice of ham in the center. 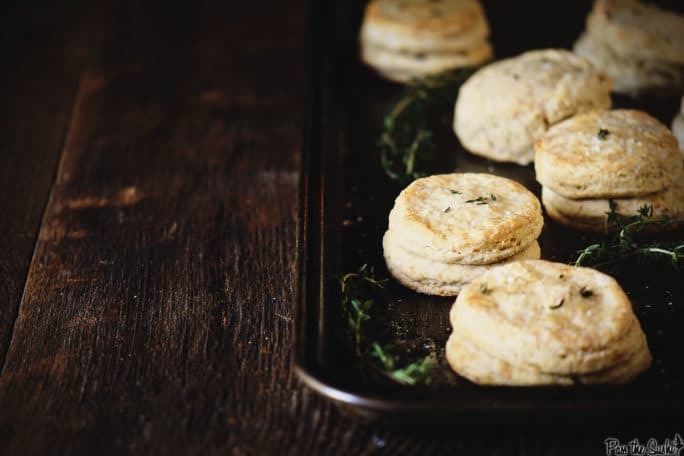 Serve these fresh biscuits with a hint of lemon and savory thyme warm with soft butter for spreading. Preheat the oven to 425 degrees F and line a baking sheet with parhment paper. In a large bowl, whisk the flour, baking powder, soda, wheat germ, salt, lemon zest and thme together. Using your fingers (or a pastry cutter), cut in the butter until the mixture has only pea sized crumbs of butter remaining. Make a well in the center and pour the buttermilk into. Mix with a wooden spoon untilt he dough just comes togehter (it will still be sticky and loose). On a lightly floured surface, turn the dough out and knead until it holds, 3 or 4 times. With biscuits, always be careful to not overwork the dough. Dust a rolling pin with flour and roll the dough into a 1/2" thick disk. Cut biscuits out with a round cutter dusted in flour. Arrange on the baking sheet 2" apart from one another and gently reroll any excess dough and turn that into a biscuit or two as well. 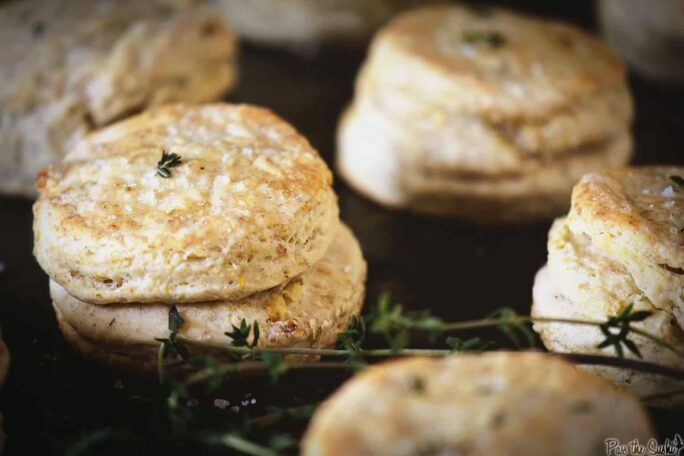 Brush the top of each biscuit with a bit of water and sprinkle with salt and thyme. Bake the buscuits until fluffy and lightly golden, about 12 to 15 minutes.